Ron Gallas is an award-winning sculptor residing in Minnesota. He received honors as an Emeritus Associate Professor of Art at St. Olaf College in Northfield, MN following his retirement in 2016. His work can be found in The Craft and Art of Clay; Low Fire Ceramics: A New Direction in American Clay; 500 Figures in Clay; Salt Glazed Ceramics; and The History of American Ceramics. His work can be found at The Dakota Jazz Club and Restaurant and Duffy and Partners Design Agency in Minneapolis. Gallas’ teaching assignments have included the Pennsylvania State University; Macalester College; and St. Olaf College. Ron Gallas’ awards include a National Endowment for the Arts Apprenticeship Grant, a National Endowment for the Arts Craftmen’s Fellowship, a Ford Foundation Faculty Enrichment Grant, and a Ford Foundation Matching Funds Grant. 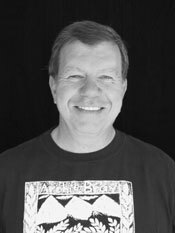 Ron has shown in regional, national, and international exhibitions, and conducted countless workshops throughout the United States in the past 43 years. Ron Gallas’ legacy will also live on in the Ron Gallas Cup Library, which allows faculty, students and staff at St. Olaf College to borrow handmade ceramic mugs. Each of the 100 mugs in the Cup Library is a unique handmade work of art created by nationally recognized ceramicists. Some are Gallas’ own work, while others were purchased from other prominent artists and galleries. Every vessel has a story just like every piece of artwork created by Ron Gallas, leaving a legacy of meaningfully unique objects made from clay.